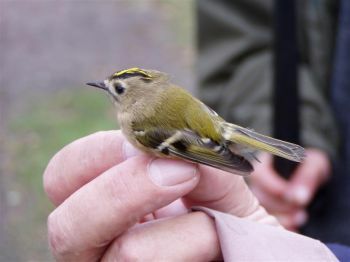 The Goldcrest (Regulus regulus) is the UK’s smallest bird and weighs as little as a twenty pence coin. Its call is a high pitched tsee, tsee, tsee, this call is one of the first sounds to go as the ears fade in later life. The bird is specially adapted to conifers such as pine, spruce and fir, because of its small size and ability to squeeze between the needles where it can feed on small insects. The bird is recognised by the golden, yellow crown stripe. They build a nest consisting of spider’s webs, mosses, and lined with feathers, this is then suspended from a branch.